has always been placed on respect for individuals. These are the passions that drive us here at Morita. help people to pursue spiritually rich lifestyles, where they are able to live happily in good health. We all are greatly indebted to "nature", "nation", "family", and "life". This is the word from our founder Junichi Morita, who believed that sincere business practices result from a sense of gratitude and an awareness of our obligations toward partners, and this sprit has shaped Morita's Corporate Philosophy from the company foundation. In any age of history, all living lives are indebted to something or someone throughout their process of evolution. A belief in the Four Great Obligations; "nature", "nation", "family", and "life" has been inherited to become "DNA" of Morita. The idea of "indebtedness" (obligation) has its roots in the sense of gratitude that arises when a favor is given, and that favor is acknowledged and appreciated by the receiver. 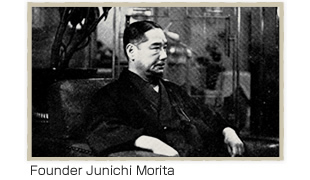 Any attempts to contribute services to society are meaningless if sufficient regard is not given to "obligations to the people, to every human being in this world" - this belief has always been at the very heart of Morita's business. We here at Morita set about our business each day with this founding philosophy and attitude toward business sublimated in the color of the Tartarian aster flower (grayish purple blue) as represented in our logo. Serving as the communication mark of the Morita Group, the three standing ovals symbolize Moritaﾕs corporate concept of supporting "health" through "technology" and "information." The hue of grayish purple blue used for the mark is the same as the color officially adopted by the American Dental Association (ADA) in 1896.